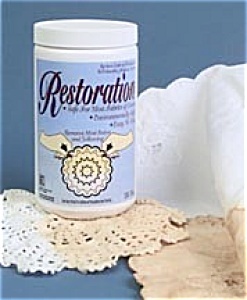 Restoration Fabric Restorer by Engleside Products. Whitens without bleach! Removes Most Stains: Coffee, blood, tea, grape juice, wine, ketchup and much more. Removes Yellowing: Mystery spots & yellowing caused by water damage, age, UV rays and even discolored fold lines. Will not harm fine delicate material fibers: Contains no chlorine, will not leave residue or harm fibers in any way. Safe for most fabrics and colors. Easy to Use. Enviornmentally Safe. I do not recommend using this on silk or wool textiles, but it is perfect for cotton and linen textiles: Antique Linens, Doilies, Christening Gowns, Laces, Curtains, Bedding, Table Runners, and more! I use this product to remove the yellow discoloration found in a lot of my textiles from age and storage. Weighs 2.5 pounds to ship.